This Mint Chocolate Cake with Mint Buttercream frosting looks like a Winter Wonderland! 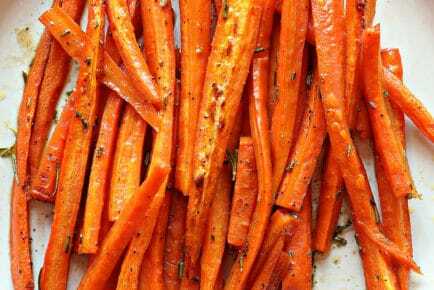 It looks like you have spent hours in the kitchen, but it is actually quite easy! 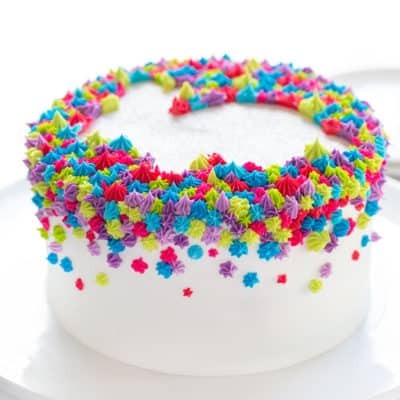 I love how easy it is to decorate this cake, but love the flavors even more. Something about the peppermint flavor deceives me into thinking it’s ok to take one more bite… it can’t be bad for you, right??? 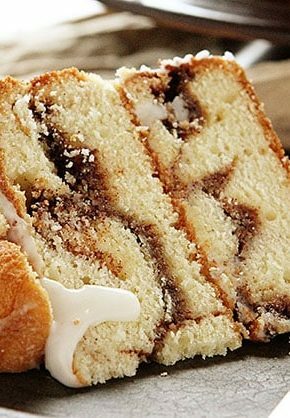 This is a big recipe and one that is specifically written for three 8-inch by 3-inch cake pans. It is a glorious chocolate cake that has a wonderful minty flavor. Perfect for a winter treat! Begin by making chocolate cake in three 8-inch round cake pans. Bake according to recipe directions and cool to room temperature. I prefer to decorate a very chilled cake layer as this can minimize the crumbs and also make it very easy to handle the cake. 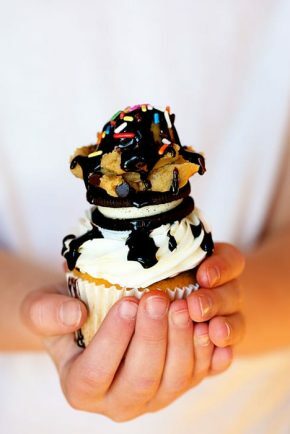 You don’t want your layer to be frozen as this could cause the buttercream to sweat, but very chilled. 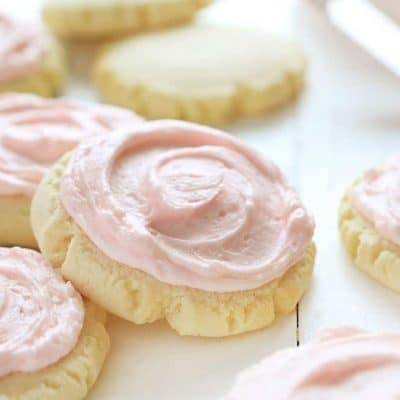 Oh my word I can’t get enough of this sweet buttercream! The perfect amount of mint extract creates the most delicate and satisfying flavor. 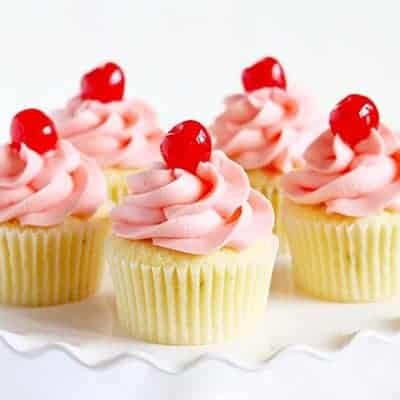 To make sure your buttercream is perfect but sure to have your dairy at room temperature. 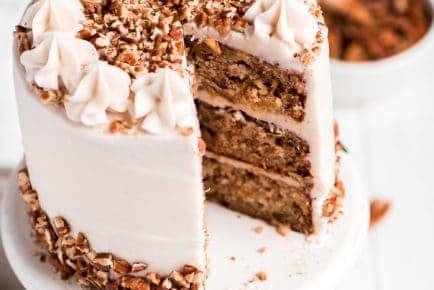 When you are ready to frost this cake, prepare buttercream. Place one layer of chocolate cake on cake stand. Cover with about 1/2 of buttercream. Set other layer on top. 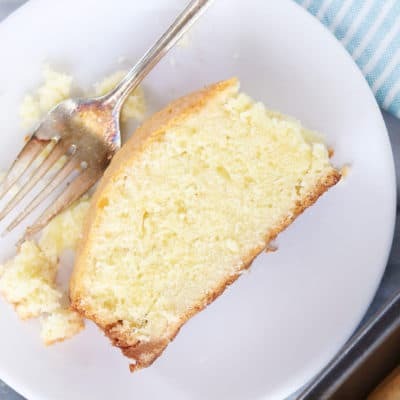 Cover cake with a smooth layer of buttercream. Place final layer on top and finish covering in peppermint buttercream. 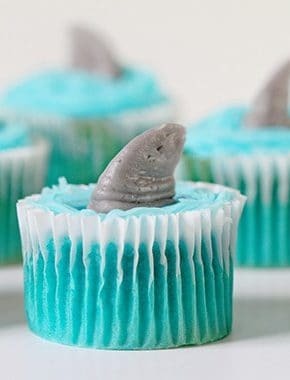 Smooth frosting. Be advised: You may need to do a crumb coat (layer of frosting that seals in crumbs) and another layer of frosting. Chill cake until ready to assemble. Creating a stunning design is simple when you have the right tools; I was able to create whimsical pine trees to adorn the outside of a simple but delicious peppermint chocolate cake covered in mint buttercream. Pour 1/2 cup chocolate into a plastic disposable bag. Secure with a rubber band and heat in microwave for 30 seconds to 1-minute. Massage chocolate after heating. If all morsels are not melted, heat in 10-second increments until fully melted. Cut off a small tip from the bag. 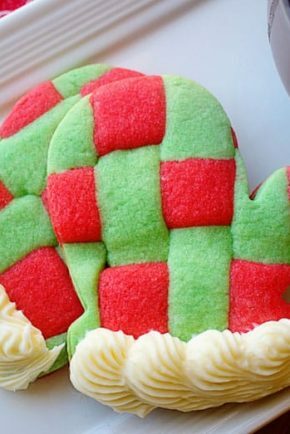 Pipe out an evergreen tree shape onto a cookie sheet lined with parchment paper. 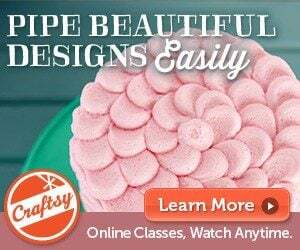 You will want to pipe out enough for the entire cake, about 8-12. Chill the chocolate trees until solid. 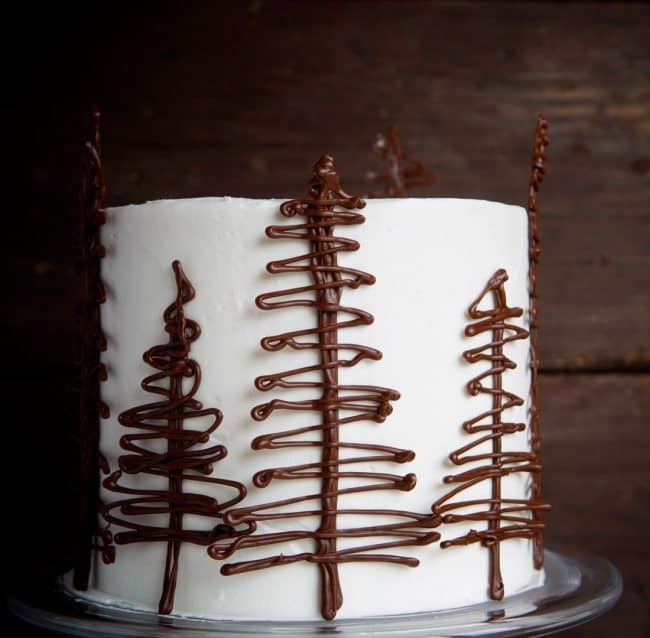 Gently place trees around the edge of cake. Chill until ready to serve. 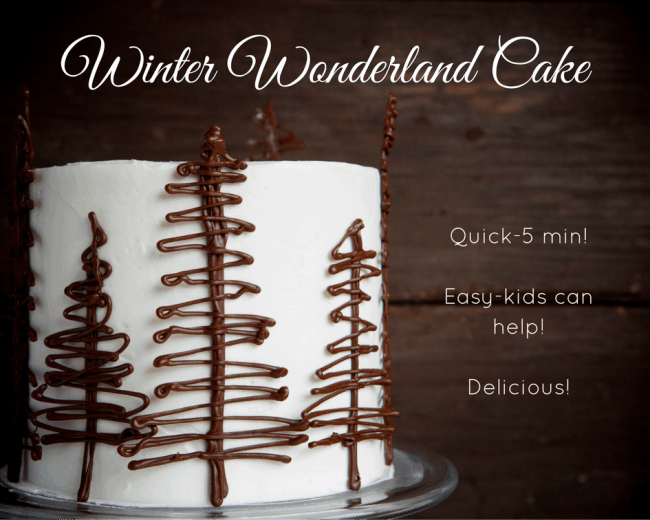 This Mint Chocolate Cake has been transformed into a Winter Wonderland! It looks like you have spent hours in the kitchen, but it is actually quite easy! Whisk together the cocoa and boiling water. Set aside to cool. Sift together the flour, baking soda, salt, and baking powder and set aside. 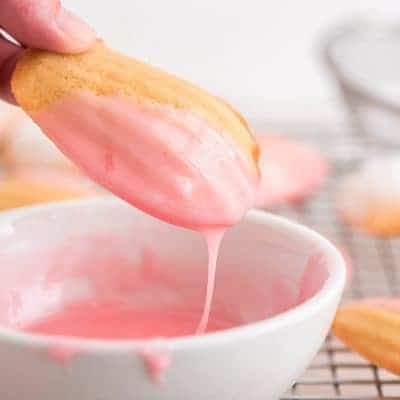 In the bowl of stand mixer fitted with paddle attachment, cream together the butter and sugar until light and fluffy, 2-3 minutes. Beat in the eggs, one at a time, then stir in the peppermint. Add the dry ingredients alternately with the cocoa mixture. Mix only until combined. Divide evenly between the three prepared pans, and tap on the counter to settle. 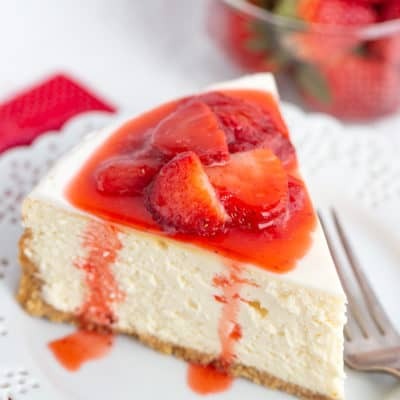 Bake for 18 to 22 minutes in the preheated oven, until a toothpick inserted comes out clean, and the cake pulls away from the sides of the pan. Cool cakes on a wire rack. 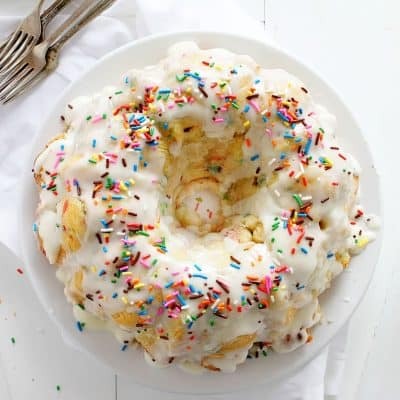 In the bowl of a stand mixer fitted with a paddle attachment, cream butter on medium-high speed until light and fluffy, 2-3 minutes. Reduce mixer speed to low, and add the pinch of salt and the confectioner's sugar, about 1 cup at a time, until thoroughly combined. 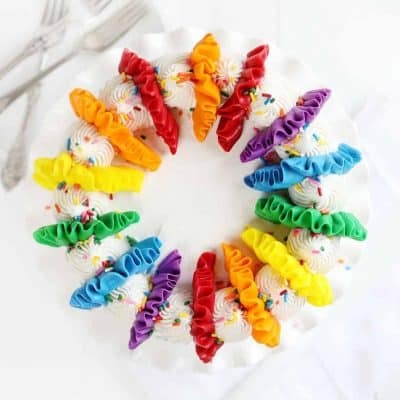 How cute and easy! Love this! 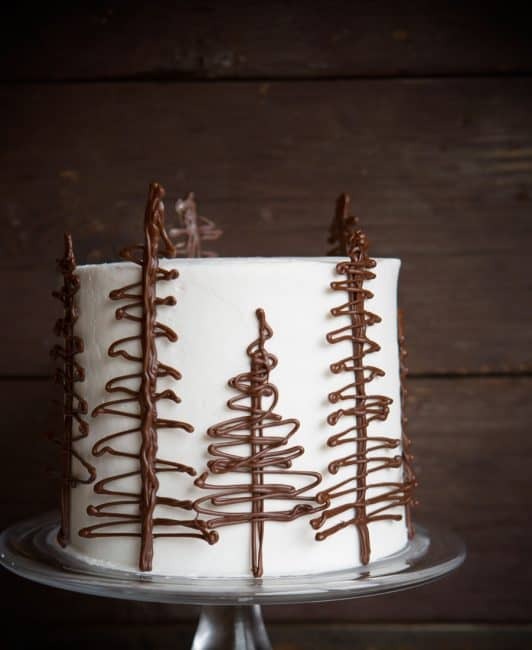 If I use chocolate frosting will white chocolate trees work as well? 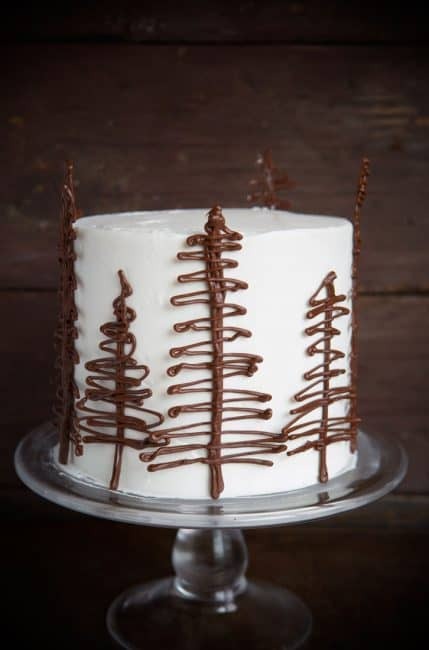 I like the simplicity yet elegance of this cake. Your picture is a bit misleading though,… either that’s 3x 6″ layers, or 5-6x 8″ layers. Followed recipe and 3x 8″ layers comes to about half the height of the cake in the picture. And as for the frosting, the recipe barely gave me enough to put a little between the layers and a crumb coat, no way was there enough to nicely finish the exterior. Thanks for the tip on making the trees, that’s really cool.